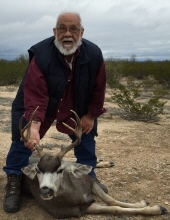 George G. Flores entered eternal life with the Lord at “high noon” on April 4, 2019 at the age of 75. A true cowboy at heart, he was an avid hunter and fisherman, but is best known for his storytelling of the one that got away. Regarded by many as “Shorty” and “Grandpa”; his gregarious personality and unity of family captured the hearts of all. George was born in San Antonio, Texas on June 3, 1943. He honorably served in the United States Army from 1961-1964. On November 29, 1964 he married Carmen Castilleja, his “Morning Dove”. He is survived by his wife of 54 years, Carmen Flores; his daughter and son-in-law, Yvette and Thomas Massa, daughter and son-in-law, Roxanna and Carlos Ramirez, daughter Veronica Carlos and Maclovio Salas, son and daughter-in-law, George and Jana Flores, twelve grandchildren and three great grandchildren. George left behind countless beautiful memories and made a lasting impression on everyone he met. His legacy will forever live on in our hearts and he will be deeply missed. Visitation/Viewing services celebrating his life will be held on April 15, 2019, 4-8 p.m. at Puente & Sons Funeral Chapels-NE 14315 Judson Rd. San Antonio, TX 78233. Funeral/Burial Services will be at St. Helena Church 14714 Edgemont Street San Antonio, Texas on April 16, 2019 at 1000-1040. Burial will be at Fort Sam Houston Cemetery San Antonio Texas shelter 2 at 11:15. To send flowers or a remembrance gift to the family of George G. Flores, please visit our tribute store. If you would like to donate to the family, please visit the George Flores Tribute Fund. To send flowers or a remembrance gift to the family of George G. Flores, please visit our Tribute Store. Or, if you would like to donate to the family, please visit George's Tribute Fund. Help ease the financial burden placed on the Flores Family after the loss of a loved one by making a donation. "Email Address" would like to share the life celebration of George G. Flores. Click on the "link" to go to share a favorite memory or leave a condolence message for the family. Provide comfort by sending fresh flowers from our local florist or donating to George's Tribute Fund.